"A Great Day Waterfowling at the Pits"
Well, it was quite a day. It started with me talking my youngest son into going with us Saturday night because of the convenience of being able to drive right to our hunting spot. He is recovering from ACL surgery due to a football injury this fall. He had a great hunt and did it all in his tennis shoes. As far as Sunday, it started out warm but was extremely windy so we tried to find the calmest water we could and set out two sets. We separated the goose set from the duck set and positioned our blinds on the corners and one in the middle. Because of the wind the birds were reluctant to pull up real close to shore so we had to change our set and move the decoys farther out in the water. We had several flocks of both ducks and geese work us early but they slid off with the strong wind just out of good gun range. After we rearranged the decoys the birds were still struggling to buck the strong winds all the way into the decoys but we did have several that did. Jake (our lab) had a busy day. 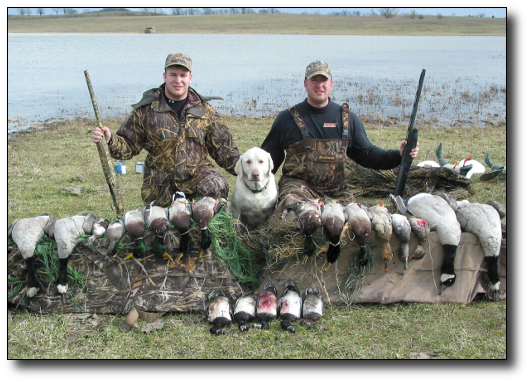 He had 21 water retrieves and 1 land retrieve. Because of the strong winds even the birds that decoyed ended up being a 50 yard plus swim for him. His longest retrieve took him all the way across the pond as the bird that we thought was dead ended up being alive and kept diving on him just out reach. He finally caught the bird but had a long swim back against the wind and by then, it was almost all white caps. 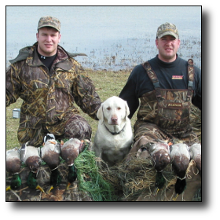 It would be very difficult to hunt these ponds without a good dog. We like to have options so we tend to bring a lot of gear. I loaded as much as I could get in my truck and on my hitch carrier. Duck floaters and duck full bodies. We started out with no mojo's but because of the way the ducks were working we ended up using two mojos. We had goose floaters and goose full bodies. We weren't able to use all the full bodies because the wind was so strong it kept knocking them over. We use layout blinds but the cover is non-existent so even they stick out. We try to position full bodies around the blinds as much as possible to help conceal them. My sons (Jeremy and Justin) were shooting 3.5" steel loads. Since I was positioned by the goose decoys I tried 3.5" Hevi shot for the first time. I was impressed. Too bad I ran out! We shoot Benneli SBE's and my youngest son shoots a Browning Gold.